One highlight of my time in Aswan was the weekend I spent with Mohamed Said and Sheik Abdine at Sheik Abdine's farm in Agabah. 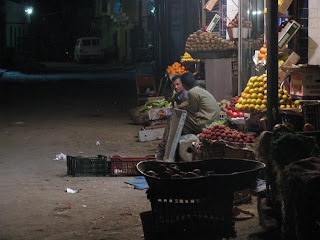 We had to sneak out of Aswan at night and pay the bus driver extra. 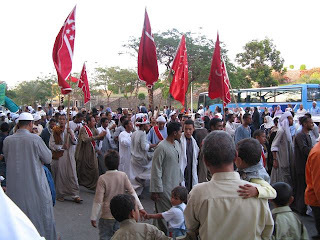 Egyptians need a permit from the police for a tourist to stay at their house. The police don't trust anyone with the Sheik in front of their name because that means they are a very strict Sunni Muslim so we wouldn't have got the permit. Ironically, in my experience, people called Sheik have been the people I can trust the most. Abdine assured me that he would try not to behead me. Sheik Abdine's family had a huge house. They purchased their farm for $10,000 back in the day but it was worth a lot of money now. Someday someone is going to want to build a hotel on it. It was beautiful to drink tea by the Nile at night and watch the cruise ships drift by, their lights twinkling and their bowels filled with sleeping tourists. 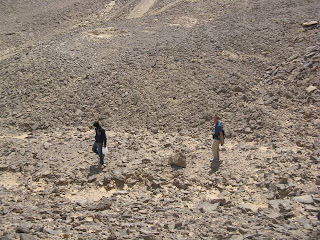 One day we packed up some tea leaves and water and went for a hike in the desert. Whenever we found something flammable we brewed some tea. Whenever we found some shade we rested for a bit. On our way back Mohamed, spotted an ancient granite block. It clearly had part of man carved on it. The thing is that some of the sides had been broken recently my theory is that it got dropped while someone was moving it. When they built the Aswan dam a European company moved eleven temples out from where the lake would be. As a reward the president let them move one temple all the way to Europe to keep. Maybe one of those guys dropped part of a block by mistake. That's my theory. Egyptians dream about finding ancient artifacts and becoming fabulously rich. 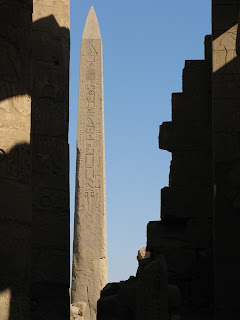 Lots of people in Luxor have actually found things. I know someone in Luxor who found an ancient scarab. He thinks it is worth eight thousand dollars on the black market. 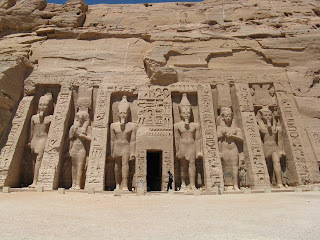 Abu-Simbel is huge and awe inspiring. It is a marvel of art and engineering. It sits right on the bank of the lake formed by the Aswan dam. The inside is well preserved. You can see the original colours from 3000 years ago. It's really stunning. It wasn't busy when I arrived, and after half an hour all the other tourists left and I was alone in the temple with just a couple security people outside. It's too hard to take everything in. You get lost and confused about which chambers you've visited. I find that in situations like this it helps to pick a narrow aspect and focus on only that one thing. For example, I tried to count how many times the Egyptian god of fertility was portrayed. There were at least eight instances. Finding all of eight is like playing "Where is Waldo?" but with a winky instead of a hat. It's the juvenile humour that keeps me young. One time a friend of mine stole a book and gave it to me. I have three theories why he may have done it. Maybe because it was a government shop and he didn't like the government. Maybe it was because he used to work there and didn't like the place. Maybe it was because he was stoned on drugs at the time. All that was true. I couldn't decide what to do, so I read the book and found it surprisingly enjoyable. When it came to people stealing my stuff I took a much less lenient view. It was 4 am. I had been at the bus station since 2:45 waiting for the micro bus to Abu Simbel. There was only one other person there. He wanted to borrow my cell phone but there was no money on my SIM card so I swapped in his SIM and changed the language to Arabic for him. He was talking on the phone and walking around. I started getting uncomfortable with how far away he was, so I got up and walked closer, still giving him his privacy but keeping an eye on him. We walked all the way to the end of the bus station and back like this. I was a little annoyed at this point. He went over to the water fountain and started drinking. Then very calmly he jumped the fence. I don't remember running to the fence or jumping over but I remember being surprised how far it was to the ground on the other side. It was dark. I was in a muddy field. I could just make out his gray robe running away. I was yelling "La la la! (Arabic for 'no no no') Thief!" I fell. I scrambled up. I fell again. I spotted him running in a different direction. There were dogs barking on every side. He fell. I didn't see him get up. He was still on the ground when I almost stepped on him. I told him to give me the phone and he held it out. I checked that it was mine. I considered returning his SIM card and decided against because it was dark and dangerous and he deserved to lose his $2 SIM. I leaned over him and yelled, "Stupid." He yelled "Stupid" at me. I stormed back to bus station. As I walked back I thought about how I used to like playing hide and seek at night as a kid. Then I was ashamed for thinking that. Later, when it was light, I looked at the field and there was no way he could have outrun me. It was surrounded by a high wall on three sides and a deep irrigation ditch on the other. Egyptians stay up fantastically late. In Luxor you can get ironing done after midnight. In Aswan you see fathers taking their preschool aged sons to get their hair cut at 2:00 am. The men in the photo were selling fruit next to a mosque at 4:00 am. I tried to buy some bananas from them but they were out. I went a block further and a guy asks me, "You want banana?" I told him I didn't need one, thanks. To this day, I'm not sure if he overheard me or if the offer was more sexual.